TESTING A FULL FACE OF MAKEUP REVOLUTION PRODUCTS! Makeup Revolution is probably a brand that you will have probably heard of at some point in the last few years. Either you will have seen it in your local Superdrug in the UK or in Ulta in the US or you will have seen a lot of beauty bloggers and YouTubers reviewing these products. This brand is all about creating great products at affordable drugstore prices with most products retailing for under £10. Now when I think of this brand I immediately think of the amount of dupes they have created of high-end makeup like Tarte, Kat Von D and Urban Decay but for the fraction of the original price. However, they are coming out with new products all the time that are not always dupes and most of the products in their collection are amazing quality. Time and time again, Makeup Revolution are bringing out new products that are loved by so many people; one of these products was the Conceal & Define Concealer which was loved by so many in the beauty community! I have loved this brand since I started my blog in 2015 and there are so many great products that I use in my everyday makeup routine. There are so many products in their range from eyeshadow palettes to foundations and they seem to just keep expanding their collection. Recently they have started getting into more face products and have released a new foundation and concealer in the last couple of months - which I was super excited about trying. Even though this is an affordable brand, where concealers are only £4, the quality of their products are usually amazing. However, there are some products that do not perform as well as I had hoped but that is the case with any brand (you are not always going to love every single product in a collection). But, this does not mean that I do not love the brand as a whole as I have found that most products are such great quality. In the past I have found the packaging of Makeup Revolution to be pretty boring but they have definitely stepped up their packaging in the last year and their packaging has definitely improved but still remained affordable. 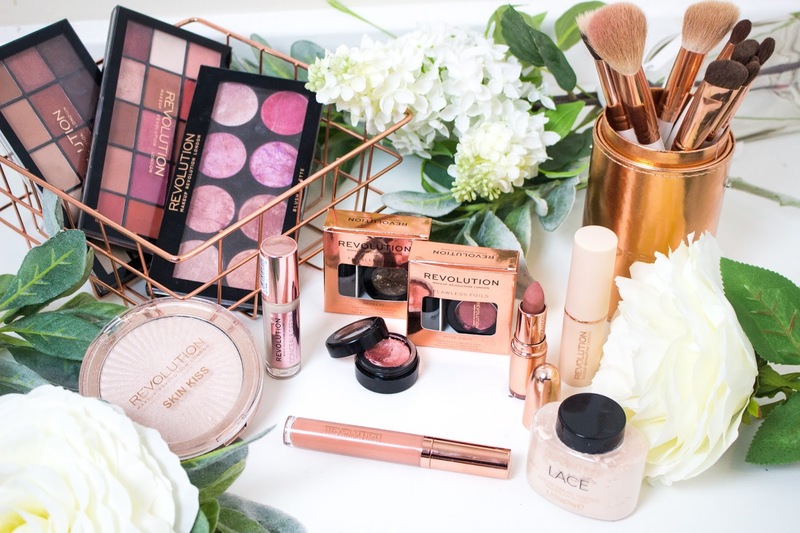 Makeup Revolution has also recently brought out a new Revolution Pro range which I am excited to try out in the future and maybe review on here as well! I am trying to include more drugstore brands on my blog and I knew that Makeup Revolution was a brand that I had to include. I have mentioned this brand a couple of times in past blog posts but I wanted to include another post that was fully dedicated to this brand. At first, I did not know what I should do and then I realised that Makeup Revolution now has a product for every step in your makeup routine - including brow products, eyeshadows, concealers and mascaras. So I decided that the best way to showcase this brand is by showing you how you can create a full face of makeup with this one brand and write mini reviews of each product mentioned. Some of the products mentioned are products that I have been using for months and some are brand new to my collection and will be more of a first impression review. Out of the whole Makeup Revolution collection, the only products I have not tested for this blog post are any of their beauty tools (like brushes and sponges) but I might review them in the future. In total this whole face of makeup will only cost £84.50 and that includes every product needed to create a full face of makeup (which I think is a bargain). Obviously this will be even cheaper if you don't buy every single product as not everyone will use two products on their brows or use two types of eyeshadows, but I wanted to test out as many products as I possibly could. At the end I am going to give my honest opinion of what products I think are worth purchasing and what products did not perform that well on me! I just want to say that just because a product does not work for me doesn't mean that it won't work for you and there are sometimes batch inconsistencies and products perform differently on everyone as noone has the same skin tone or skin type. So please don't be offended if I say I dislike a product that you absolutely love and I am glad that it works for you! Makeup Revolution is available from Superdrug and Revolution Beauty. You can also now purchase Makeup Revolution from Ulta if you live in America! All products linked will be from the Revolution Beauty website as they do ship internationally! WHAT I REALLY THINK ABOUT THIS FOUNDATION! 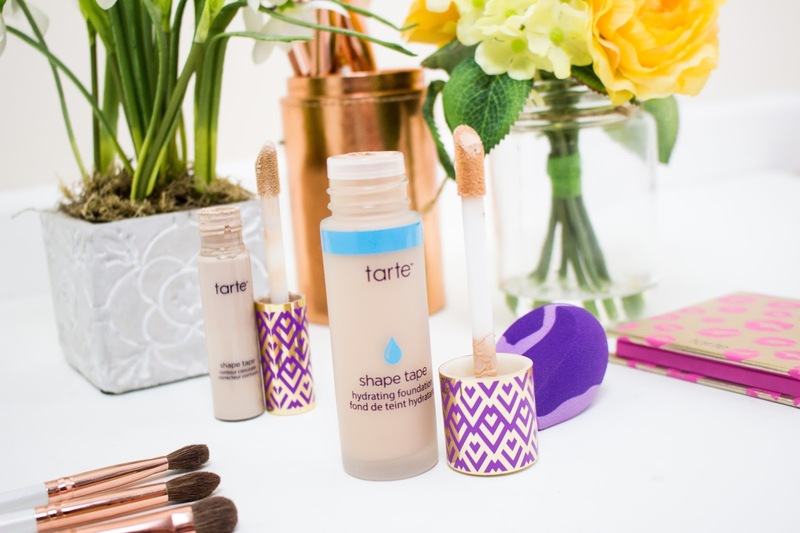 Unless you have been living under a rock for the last year or so, then you will know that one of Tarte's cult makeup products is the Tarte Shape Tape concealer. This is the concealer that is raved about in so many blog posts and YouTube videos and is a firm favourite amongst a lot of beauty bloggers. I have been using Tarte Shape Tape for the last 8 months and I have been loving it and using it pretty much every single day since I got it (the Makeup Revolution concealer is similar but there are a few differences). Since using this concealer I have been wanting Tarte to bring out an accompanying foundation, so when I saw the news that Tarte would be releasing a Shape Tape foundation I was pretty excited. Now, if you follow beauty news you will probably know that so many people were excited about this launch however that excitement turned into anger amongst a lot of people. This was over the shade selection that had been used for this foundation - when it was first released there were only 15 shades (and most of them were predominantly for people with fair to light skin tones). I believe when it was first released there were only two shades that were specifically dark enough for anyone with a deep complexion, which is not right at all, especially when you think Fenty Beauty managed to bring out 40 shades in their first launch. Tarte have added another 3 shades to their foundation line but there is definitely a lot more shades that can be added and I hope they add more very quickly. I do not agree with the shade range of this foundation and brands definitely need to include a majority of shades with different undertones as not everyone has the exact same skin tone! Unfortunately this is not the only brand who has brought out a limited shade range, however there are so many brands out there that do cater to 40 or 50 shade ranges which is great! I have now addressed the controversy surrounding this foundation and I now want to focus on the product itself. I do feel like Tarte didn't handle the launch of the foundation and I do not condone the shade selection but I was interested in trying this foundation out for myself. The Hydrating Shape Tape Foundation and the Matte Shape Tape Foundation both sell for £35 or you can buy a set of Tarte beauty products from QVC for £70.